The fitness area should not look sterile or be an afterthought. You may have to force yourself to use the gym. It should be comfortable and stylish. Adding paint is a means of accomplishing that. Color has power when it comes to staying in shape with a great workout. Add orange to a garage gym for some pizzazz to the workout. To efficiently light up the garage, remove bare-bulb porcelain fixtures over each workout area. Replace them with 8-ft fluorescent fixtures. Using two 4-ft fixtures in each zone are easier to handle than 8-ft fixtures. Purchase fluorescent fixtures based on the lowest temperature experienced in the garage. Some fluorescent lights do not work in cold weather. If the temperature will be below 50 degrees, buy fixtures with electronic ballasts. They work in zero or below temperature. Lights with a color rendering index (CRI) of 85 or above allow you to see the exact color of paint. Epoxy floor paint is a high performance, dual option that is ideal for a garage. It creates a floor with a hard-wearing, easy to clean surface that will last for years. Epoxy floor coatings are available in a variety of styles and colors. They transform worn, old concrete floors into functional and aesthetically appealing surfaces. 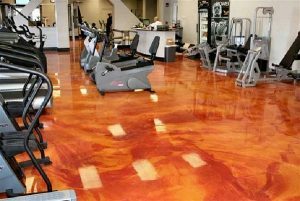 The easy to clean and low maintenance characteristics make an epoxy floor ideal for a gym. The epoxy coating is a durable, hard wearing surface that does not fade, scratch, or chip. Regardless of a floor’s current condition, a professional epoxy floor installer can make the job look simple. A modular cabinet design includes cabinets that are connected together as a stacking cabinet base or hung as wall cabinets. The interlocking assemblies can be arranged in a side-by-side or top-to-bottom configuration to create custom storage for a gym. The equipment is the fun part of the remodel. To avoid problems, do not purchase equipment without measuring. Investing in an all-in-one machine may conserve some space. Fit your gym to your workout routine. If cardio is a high priority, then, purchasing a treadmill makes sense. If free weights are not your thing, add tension bands for your workout routine. © 2016 Epoxy Floors Austin. All rights reserved.